Sew & Tell: Something to cheer about! I am so excited to share my take on the Perfect Party Dress by Tie Dye Diva with you today! When I saw Kathy's post about this blog hop a picture popped into my mind. When I looked at the Perfect Party Dress (available in sizes 0-24mo (Baby's Party Dress) and 2T - 8) I saw a perfect canvas for a cheerleader-inspired dress! We live in WA state - and are big Seahawks fans - so this was a perfect excuse to make some "12th man" (or "12th girl!?") gear! The Baby's Party Dress and Perfect Party Dress are great as-written - - but they are also a perfect canvas for some "play"! - Shortened the skirt by 1"
While this won't be a FULL tutorial for all of these changes, I did take some pictures along the way and have tips and tricks to share with you! 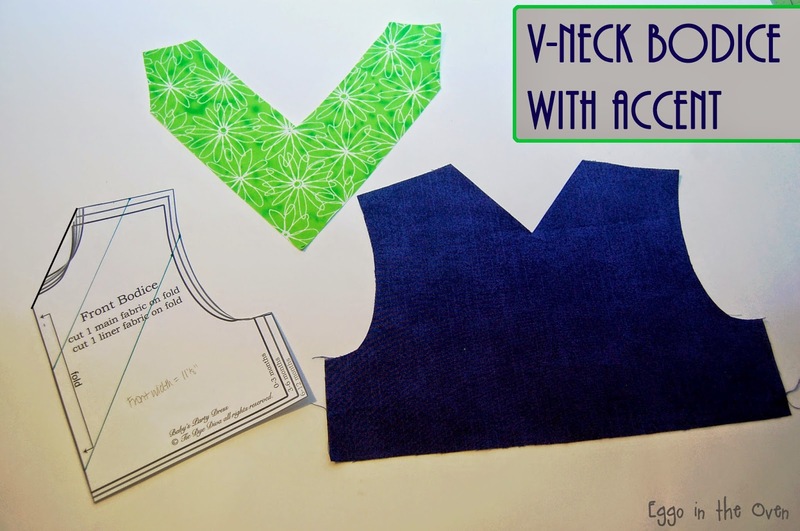 To achieve a v-neckline I took my front bodice pattern piece and drew a diagonal line from the shoulder seam to just below the original neckline for two sizes smaller. This was just what "looked right" - and after sewing it up, it is a great angle and gives the dress a v-neck without it being inappropriate for a kiddo! I then used that line / angle to create the bodice contrast "v". Again, I eyeballed where to draw the lines. I drew the bottom line (closest to the bottom of the bodice) first - as I knew it needed to land high enough to not get caught in the seam allowance. Then I drew another line between the v-neck of the bodice and the bottom accent line - and wah-lah! I took a look at the pattern piece and could get a decent feel for how it would look / if I liked the width of the accent. 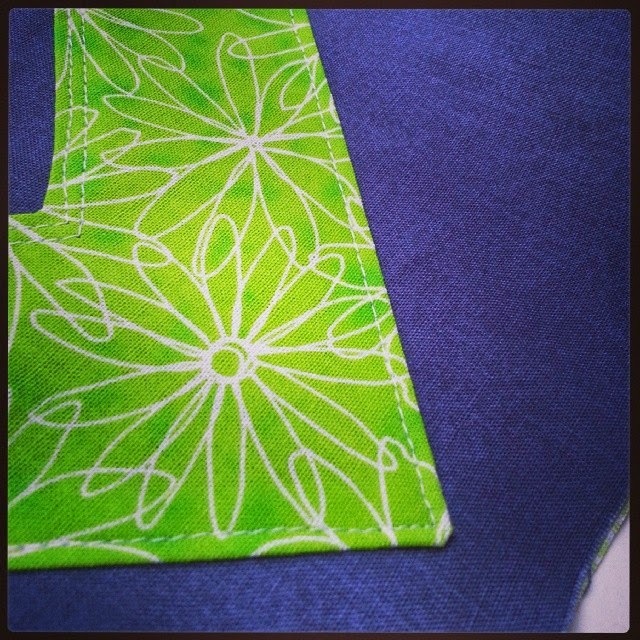 When I cut out the bodice pieces, I cut the main front (navy blue) and liner (lime green floral) first - cutting around the pattern piece set on the fold. Next, I folded the bodice pattern on the top line of the accent v. I then used my ruler to cut 3/8" away from the folded edge of my pattern - so that I had enough "extra" to fold over and iron for a finished edge. Then I did the same with the bottom line - again don't forget to cut 3/8" away from the bottom edge of the v you drew! I clipped the inside and outside of the tip of the V and ironed the 3/8" allowance toward the wrong side of the fabric - which resulted in folded / finished edges for the top and bottom of the accent. Then I just placed it on the front bodice piece and stitched two lines - 1/8" and 1/4" from the top of the accent V; and one line about 1/8" from the bottom of the accent V.
The baby's party dress pattern includes sleeves. I wanted to make mine sleeveless to more closely resemble a little cheerleader outfit, so I left the sleeves off. I followed the directions in the girls pattern for the bodice construction. Now you can add in your ties (optional) and sew the side seams (making sure to finish the raw edges) by putting the front and back bodice right sides together. Topstitch around the arm holes and neck / back bodice opening. I added ties to the dress to allow for a more custom fit (as my model was somewhere between 6mo and 9mo clothes) - and because who doesn't love a bow on a dress!? :) I don't remember my exact measurements. I want to say I cut a piece of fabric 4" x WOF, folded it over, stitched it closed with angled ends at both outside edges (near the selvage), then cut it right in the middle so that each tie would be half the width of fabric long and about 1.5" wide (1/2" seam allowance) - but I'd leave you with this tip - measure the space at the side of the bodice (where the front and back connect), subtract your seam allowance for both the arm hole and the bodice / skirt joining, and make sure your ties are skinnier than that measurement! Mine were a little bit big, so I just added a small pleat / fold in them where they attached to the bodice so that I could make them work! As I noted above, I removed 1" from the length of the skirt. I did this because I wanted a shorter skirt (because cheerleader skirts are NOT meant to hit below the knee!) - and it worked out well because the dress was a *little bit* big on my model (my adorable Niece!!!). I'd suggest looking at the finished lengths from the pattern and measuring your kiddo - I could likely have taken off 2" and it would have been even better! To create the peek-a-boo panel you need a bunch of strips of fabric - I used 8 each of the main (navy) and peek (lime) fabrics. A little tip because my math / estimation didn't end up perfect..... Make your bodice first. Get it fully constructed and then measure it! You want your skirt to be the same width. So let's pretend your bodice is 24" wide when it's all finished (just throwing out a nice, round number that will make the math for this example simple-de-dimple!). I want 8 panels to span my 24" skirt. 24/8 = 3" width for each panel. Now add in your seam allowance (1/2" is a nice round number and allows room to serge all of those seams!). 3" + (1/2" x 2) = 4". So for this example I would want to cut 8 pieces of each fabric (main and peek) that measure 4" wide by the length of the skirt (from the pattern.... adjusted if you want to). Now for the construction of the skirt. Sew together the strips on the long end (the length) - main-peek-main-peek- etc. until you have them all sewn together in a big loop (is it starting to look like a big skirt?!). I suggest serging or zig-zag stitching each seam allowance so that you don't have fraying when you wash / wear it! I then pressed all the seam allowances toward the MAIN fabric (navy for me). Next, hem your skirt. I followed the directions in the pattern. 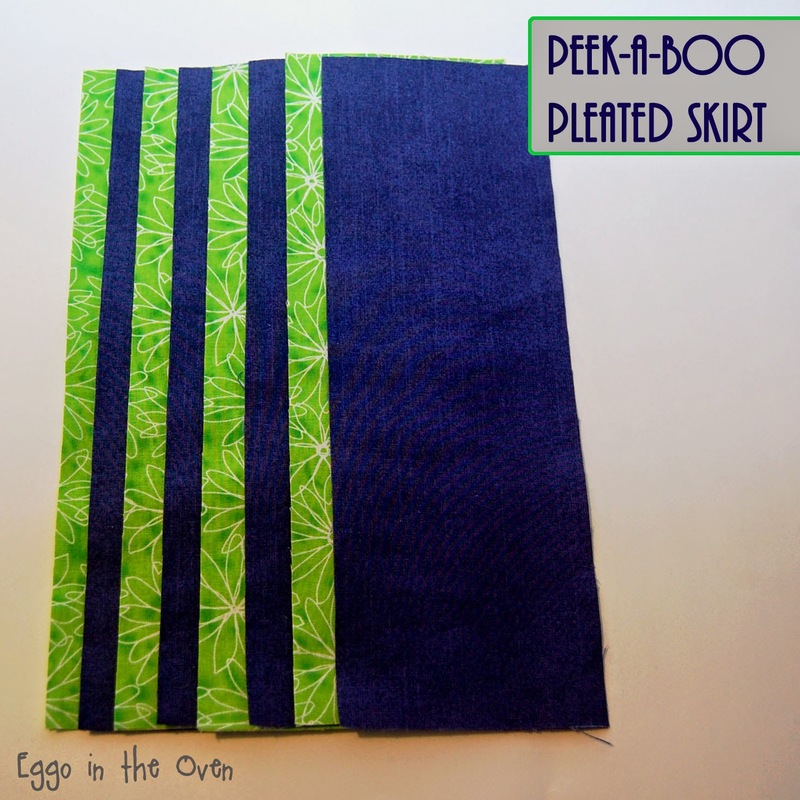 Now you need to create the "pleats" / peek-a-boo's. mark the center of each "peek" panel up at the top (where the skirt will join with the bodice). Bring both of the adjacent main fabric panels in to meet at the mark you drew on the "peek" fabric. Pin (or clip) in place and iron the full length of the skirt. The accent fabric will be hidden under the main fabric - so when you get every panel done, you will just see the main fabric. Take this skirt over to your machine and run a basting stitch along the top (unfinished) edge to secure your pleats / peeks in place. Now you just follow the instructions in the pattern to attach the skirt to to bodice. Keep in mind you *shouldn't* have to gather the skirt at all (though if your math was a little off like mine was when I made my dress, I recommend adding little gathers / mini pleats in the back of the skirt if it's just a little too wide!) I centered one of the main panels in the front of the dress then worked my way around the bodice when clipping / pinning the two pieces together. Clear as mud, right?! I'm hoping to make more of these dresses in the near future - and I promise if/when I do I will take more photos of the process! In the meantime, please don't hesitate to comment with questions if you have them! What do you think? I may be biased (because she's my Niece) - but I think my little model makes the cutest cheerleader I've seen! Want a little more incentive to pick up this pattern and PLAY!? Jen has put both of the patterns on sale for just $6 to celebrate with us! (regularly $7.95) Yippee!!! I have many of the Tie Dye Diva patterns (okay.... most of them) and love them all! If you missed any stops along the way - here are the blogs that participated in this week's hop! A HUGE thank-you to Kathy from Handmade Dress Haven for organizing this blog hop and inviting me to participate - and to Jen from Tie Dye Diva for being our cheerleader and an awesome pattern designer!!! Thanks so much Meriel! This was my first case of "I have a vision IMMEDIATELY and check.it.out - I didn't change from that vision and the finished item was exactly as I pictured it in my mind". I am definitely NOT a pattern writer / designer - but I really enjoyed playing with this one! Thanks Deanna! I'm a math nerd for sure..... but definitely learned with this project that the timing of that math is important! :) My numbers added up - - - but the number I was trying to reach was wrong - oops!